Charles Blow showed himself to be a warm and passionate speaker at the book signing event on the 13th of October at the Irondale Center. 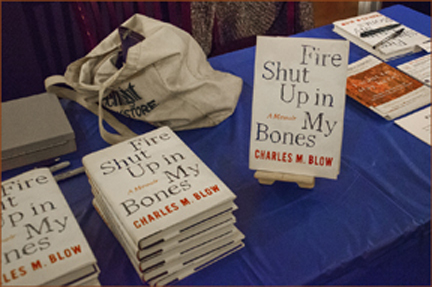 Promoting his book Fire Shut Up in My Bones he answered questions from writer/actor Gbenga Akinnagbe. Discussing themes from the book, he commented on his life story of successful education in the desegregating South and a confusing and evolving sexual identity not helped by an assault by a cousin when he was six. He was gracious, calm and optimistic about issues that are often highly charged triggers for tension and difficulty. Greenlight Bookstore and Afropunk worked with Good Neighbors to create the evening as a fundraiser for Good Neighbors. Thanks go to the restaurant No.7 and Stoli who provided the food and drink and to Nicole Adams who organized the event. Approximately $1000.00 was raised. Others - bring your contact list!